Khalil was the eldest son of Ghoraey by his first wife . Khalil married Zarkhanda and by her had a so named Umar who was known as Shaikh Umar because of his religious nature. Umar had three sons, Yaqun, Yousaf and Shaikh Abbas. Its the progeny of Shaikh Abbas that has prospered and to some extent preserved the identity of Shaikh Umar. Khalil, by his second wife, had another son named Bara who in turn had three sons namely, Barak, Talar and Ishaq. It is the offspring of Bara that has multiplied and gave birth to major clans of the tribe. Khalils along with other Ghoria Khel tribes were initially settled in the neighborhood of Kandahar. Because of the scarcity of pastoral lands, they moved to the area west and south of Ghazni and settled on the banks of river Tarnak. Khalils continued their nomadic mode of life in pursuit of pastures.In 15th century the Mughals and Hazaras started harassing them and slowly and gradually drove them out to the neighborhood of Kabul and Nangarhar. From there, they migrated to their final settlement, Peshawar valley. At that time Khalil was a very powerful tribe and took active part in the struggle against Dilazaks.Babur in his Tuzk writes, "The most powerful of the Hazaras are the Masudis and the most powerful amongst the Afghans are the Mohmands and Khalils." In 1517, a group of Khalils made inroads into Bajaur area. Subsequently Yousafzais gave them the Darra of Lashura as far as the Darra of Charmung and Nawagai for their sustenance. The brief account of the expulsion of the expulsion of the Khalils from Bajaur, wherein they never obtained a footing, is one of the blanks in their history. In 1550 AD, we find them supporting Prince Kamran against his brother Humayun. Kamran was defeated at Shutagram and while passing through the darrahs of Alinagar and Ali Shang, had taken shelter among the Khalils and Mohmands. The former , at this time, was a powerful tribe, indeed, the most powerful tribe among the Ghoria Khels. According to Raverty, Khalils had then not occupied their present seats in Peshawar district. However, from the perusal of the local history, it seems the Khalils were already in possession of their holdings in Peshawar area. It appears that in 1531 AD, on the death of Emperor Babur, Prince Humayun, the eldest and successor, confirmed his brother Mirza Kamran in his fief i.e Kabul province . The Dilazaks, then in the possession of the whole area east of Khyber pass, were loyal to Humayun. This fact was sufficient to incite Mirza Kamran’s hostility towards them. The Khalils and Mohmands appealed to him (Mirza Kamran) and he agreed to help them militarily. This event , it is evident, would have taken place soon after Humayun’s accession, at a time when he was too much occupied in other far more momentous matters in Hind to be able to aid the Dilazaks by restraining Kamran. Had it not been for Kamran’s support, it is very probable that the Dilazaks would have successfully resisted the encroachments of the Ghoria Khels. After a severe fight, the Dilazaks were finally defeated. 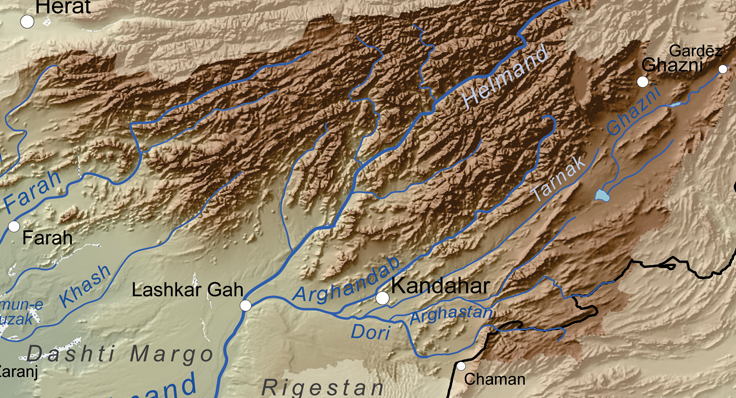 The real cause of their downfall was the hostility of the Khashi Afghans. Holding, as they did, all the country from Dhaka to Attock, with the Khyber and Kharappa passes, they had become very rich, for the Peshawar district was very fruitful and as the royal road lay through it and all the trading caravans halted at Bagram (Peshawar), the Khalils levied tolls on them in return for escorts, and as their wealth increased so did their arrogance. The plunder of a Yusufzai caravan, the murders of the two sons of the Malik of the Abazai and of the Gagiani Malik, who was venerated as a saint, in a Khalil mosque, roused the Khashis and their allies to fury and under Khan Kaju they overthrew the Khalils at Shaikh Tapur in 1549 or 1550, according to Raverty.. The present Khalil tappa or tribal area consists of a tract 20 miles long by 10 broad along the foot of the Khyber hills from the Kabul river southward to the Mohmand tappa. It is 73 square miles in area. Acting as intermediaries for various governments and Khyber tribes, the Khalil ‘Arbabs’ played an important role during the Mughal period and afterwards. It is during Emperor Shah Jahan’s reign that they came into limelight. The Emperor appointed Muhammad Asal Khan of Ishakzai section of Mitta Khel clan the revenue collector of the Khalil tappa and called him ‘Arbab’ of the area. The title of Arbab though at variance with the traditional Pashtun titles such as ‘Khan’ or ‘Malik’ stuck to the Khalil notables who are still referred to as the ‘Arbabs’. . Arbab is the broken plural word of the Arabic and Persian word ‘Rab’ meaning a ‘lord’. However, the grey beards of the Mitha Khels say it comes from a word ‘ar’ meaning ‘lord of’ and word ‘bab’ meaning gate i.e, it alludes to Khyber. However , there is no such word as ‘ar’; meaning ;lord’ in Arabic, Persian or Pashto. During the Mughal period, an ‘Arbab’ was expected to deal beside administrative measures , with the tribes of Khyber pass, Mullagoris, Shinwaris and Mohmands, collect revenue of the area and accompany the royal entourage while passing through the area and to provide the logistics for the royal forces operating in the area. He was also responsible for the distribution of ‘mawajib’ or the royal allowances amongst the Khyberi tribes. The ‘Arbab’ was handsomely rewarded in terms of money and ‘jagir’. Asal Khan Mitha Khel had received the title of ‘Arbab’ from Emperor Shah Jahan earlier than the Mohmands. He received Tahkal tappa as a jagir with sixty thousand rupes of annual revenue. His son Shaikh Abdul Rahman, who held practically independent control over the Khyber during the reign of Nadir Shah Afshar, followed him. The location of the Ghoria Khels, particularly that of the Khalils at the mouth of the Khyber pass had always given them much importance no matter whatever dynasty bore sway in the area. Each of these tribes had aristocracy of its own. The Mitha Khel Khalils has the honour of being ‘Khan Khels’ or the aristocrats of the tribe. Their authoritative conduct and high living standards made them so distinct from the rest of the tribe that the Sikhs, and subsequently the British initially considered them to be a distinct tribe.